There is no terrible way to win. There is only winning. 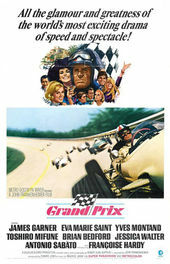 While not one of designer Saul Bass’s more famous title sequences (see Psycho or North by Northwest), the full throttle intro to director John Frankenheimer’s Formula One flick Grand Prix offers something a little different. This masterfully assembled montage of pre-race preparation features crisply aligned type and meiotic split-screens set to a soundtrack of revving motors and beating hearts. You can practically smell the burning rubber and taste the exhaust. Accompanied by the ever-intensifying roar of Gordon Daniel’s Oscar-winning sound design, Bass utilizes sporadic slow motion and almost imperceptible looping to stretch the final few seconds before the green flag drops into an eternity of tension. Author Pat Kirkham and Saul Bass on the opening titles for Grand Prix, from Saul Bass: A Life in Film and Design (p. 406).